The Aosta Valley, the smallest and least populous of all Italian regions, is a mountainous semi- autonomous region in the northwest of the country. 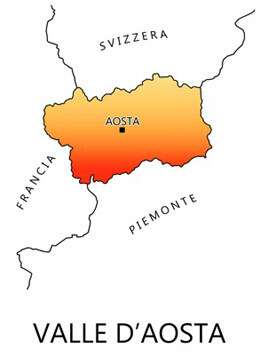 It is bordered by France to the west, Switzerland to the north and the region of Piedmont to the south and east. Valle d'Aosta is formed by a central valley with the Dora Baltea river running through it and by 13 side valleys carved out by glaciers and torrents. 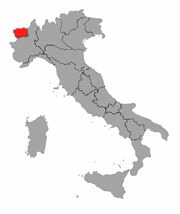 It is the only Italian region which has no provinces (the province of Aosta was dissolved in 1945). The region is divided into 74 comuni (communes). Whether in winter or in summer, the Aosta Valley is an outdoor adventure lovers dream. In summer it offers a wide range of climbing and hiking options above the valley floor. In the winter its famous skiing areas such as Courmayer, makes the valley a destination of choice for skiiers. The valleys above 1600 metres usually develop a Cold Continental Climate (Dfc). In this climate the snow season is very long, as long as 8 or 9 months at the highest points. During the summer, mist occurs almost every day. These areas are the wettest in the western Alps. Around 2000 metres the climate is mild, despite the high altitude. This is due to the high influence of the oceanic mild air that can blow at these regions. Fog is common throughout the year, especially in April and October. At that time of the year these regions can have more than a week of uninterrupted fog and mist. Italian and french are both official, but the native population speaks Valdôtain, a form of Franco-Provençal (also known as Arpitan), as their first language, while in the Lys Valley there is a Walser German speaking minority. In Gressoney Saint- Jean and Gressoney La Trinité, a minority also speaks German, which is spoken further north across the border in Switzerland. 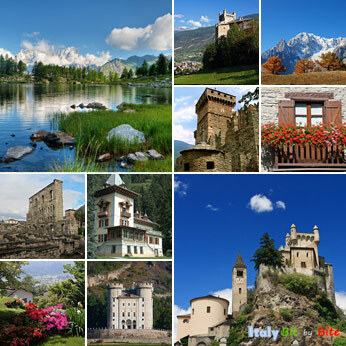 Photo credits (top to bottom): Aosta Valley collage: Aymavilles Castle and Saint-Pierre castle by Jelle Drok, Saint-Pierre Castle © antonio scarpi/Fotolia.com, Arpy lake © antonio scarpi/Fotolia.com, castello savoia © Renato Francia/Fotolia.com; Courmayeur by Jplust, Pont Saint Martin by Pascal Pizzol. The region boasts an outstanding historical, cultural and artistic heritage, with Roman monuments, mediaeval castles and Romanesque churches, as well as top-quality DOC-label wines and speciality foods.